Are you seeking practical knowledge on the subject of the industrial and logistics market in Poland? Are you planning to invest in that sector? Are you wondering about the specification and location for the planned warehouse facility? 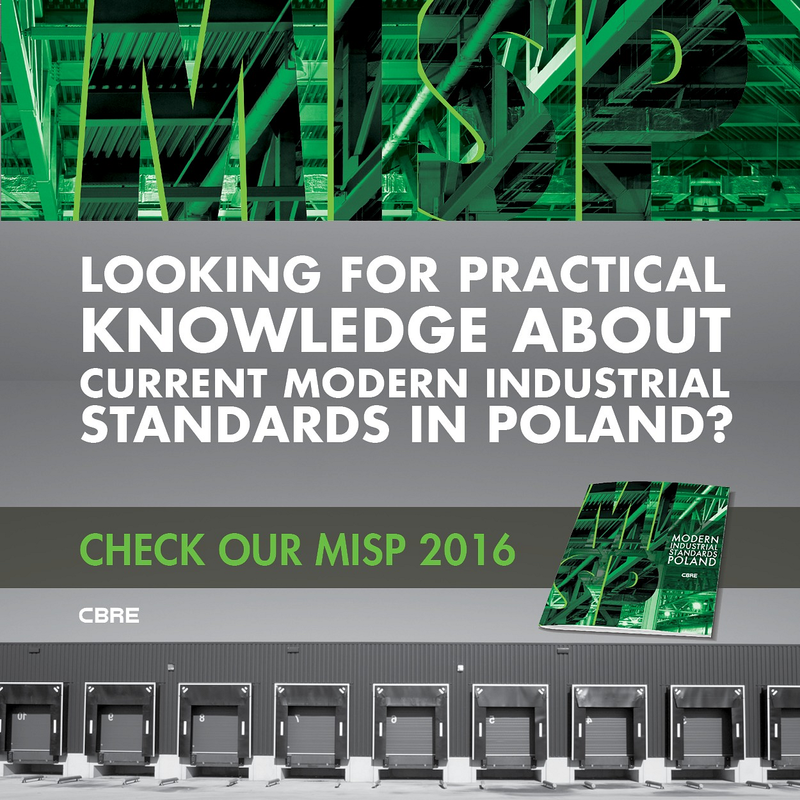 The CBRE consultancy has published the first ever market guide entitled “Modern Industrial Standards Poland 2016” (MISP), which is of assistance when assessing the standard of warehouse buildings. The publication comes with a practical tool in the form of a score card designed to determine a facility’s class as per the approved criteria. “Modern Industrial Standards Poland 2016” (MISP) identifies two main classifications that would determine the class of industrial and logistics buildings: location and quality. The location of a warehouse facility is the key factor in a project’s success. The other important indicator that determines the facility’s class is the building’s quality. In accordance with the set of criteria contained in the guide, if a building has an excellent location and meets the highest quality standards, it will be rated as an AA-class building (A-class location, A-class quality standard). The rapidly developing modern industrial and logistics market is in need of understanding and identification of standards for warehouse facilities. As a result of extensive consultations with developers, investors, tenants and designers active on the market, we have been able to determine the requirements regarding the quality of space. We are now certain that our guide will positively affect the market’s transparency and aid tenants in defining their needs. The ability to determine the class of a warehouse or logistics facility represents a great value to all the players on the market: tenants, developers, funds, agents and architects. The MISP guide provides a clear and comprehensible picture of the best market practices. Earlier editions of our guide relating to the office market (MOSP) has become the market benchmark used by all sections of the market.. We are certain that the latest edition of the guide will prove to be an equally great success and an extremely useful tool for all those active on the market. “Modern Industrial Standards Poland” is a unique tool and the first guide of this type relating to the warehouse market in Poland. It has been created in collaboration with the biggest Polish developers and investors present on our market. Consultants for the guide included representatives from the following companies: CBRE Global Investors, DHL, Goodman, Hillwood, ID Logistics, Kajima, Panatoni Europe, Philips, Raben and Segro. CBRE is planning to publish future editions of the MISP guide, which are to take into account the changing market conditions and the experiences and comments of those actually using the tool for practical purposes.